The caption says, “A man walks along the Cheonggye stream in central Seoul, South Korea.” I think that’s an understatement. 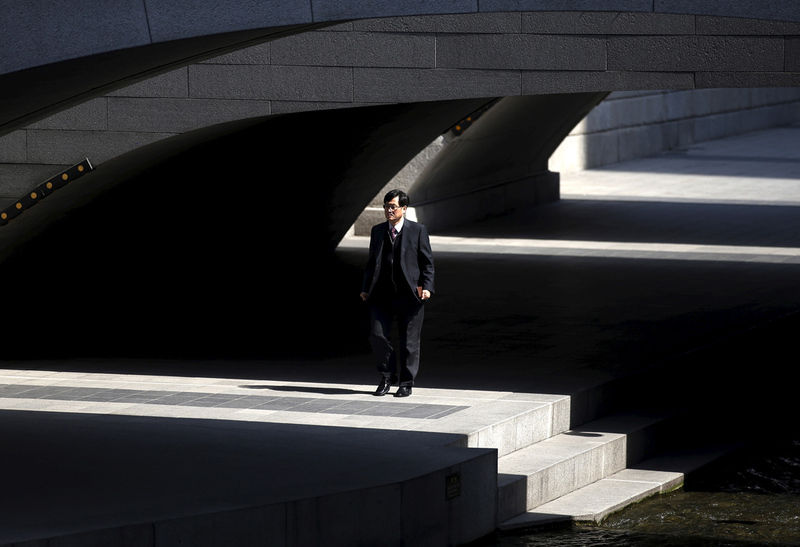 How about: A man in a three-piece suit walks on, under, and along the concrete infrastructure of a public space? Or a a man in a three-piece suit walks on, under, and along the concrete infrastructure of a public space sharply sculpted by bright sunlight and dark shadows along a stream that is part of an urban water management system? Or perhaps this: A man holding a small leather wallet hesitates on an elegant white and grey platform between the abyss behind and the abyss before him, while a stream flows by without remorse. Or, a lone man walks tentatively through an empty space amid abstract structures, as if uncertain of what will happen next. Or, the official walked through light and darkness to carry out his duties, small as they were; the river awaited him. The spy considered whether he was too late, even though he was too early, too visible, and already a dead man. As the well-dressed man walked on the clean city sidewalk by the beautiful bridge, he thought about jumping. You get the idea. The stream is barely visible; the street and structure could be in any modern city, and the man is the anonymous embodiment of a type. The scene captures key elements of 20th century modernism: a lack of ornamentation cues the dominance of functionalist design, uniform materials, abstract spaces, geometrical forms, and black and white contrasts. In fact, not much of the world looks this barren or this purely engineered, and not many men wear suits anymore, and the image of the “man in the grey flannel suit” alone in the anomie of the concrete jungle is a figure from another era. And yet, here he is again, and perhaps more remarkable for that. Let’s be clear what this image is not. It is not news. It is not emblematic of a significant event or current controversy. It is not a sign of the times or a new fashion or trending activity. And yet it is photojournalism, and it was selected for the Photos of the Week at the Atlantic. More to the point, the who, what, where, and when really don’t matter much here. (If you look closely, he might be wearing a sweater rather than a vest. I’m not sure he’s carrying a wallet, either. Note that we’re not told the name of the street, etc.) Which leaves us with the why. 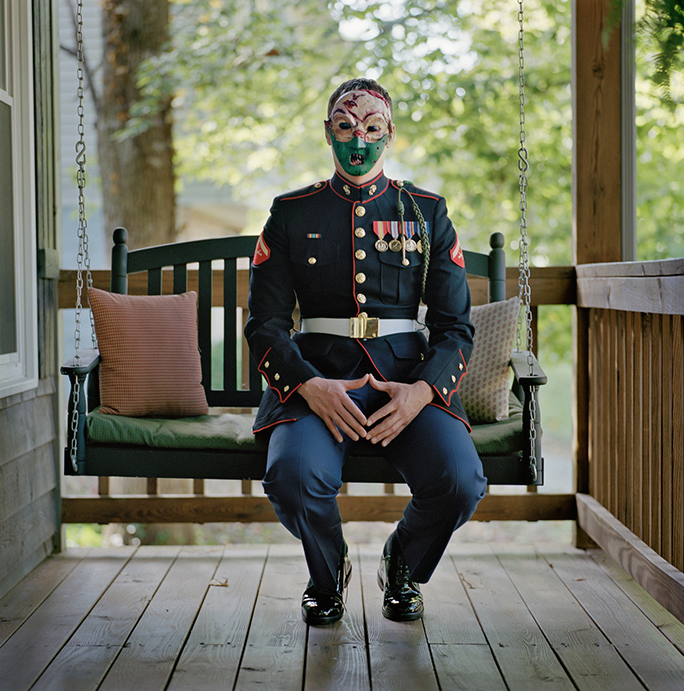 And the why is doubly important, because what the photograph certainly is, is enigmatic. Although quintessentially modernist, it’s no longer clear whether the world depicted has a future. For all the strength and inertia of the concrete structures, they already seem almost permanently empty, and he seems both wittingly and unwittingly vulnerable. Kafka’s K comes to mind, which takes us even farther back. And by the way, where are the women? Now modernism becomes an empty space that we walk through but would not want to inhabit; and enlightenment serves primarily to demarcate the dark places, which are larger than we knew. He is caught in the light, but like his shadow, he will soon disappear. Take a look at the last modern man. 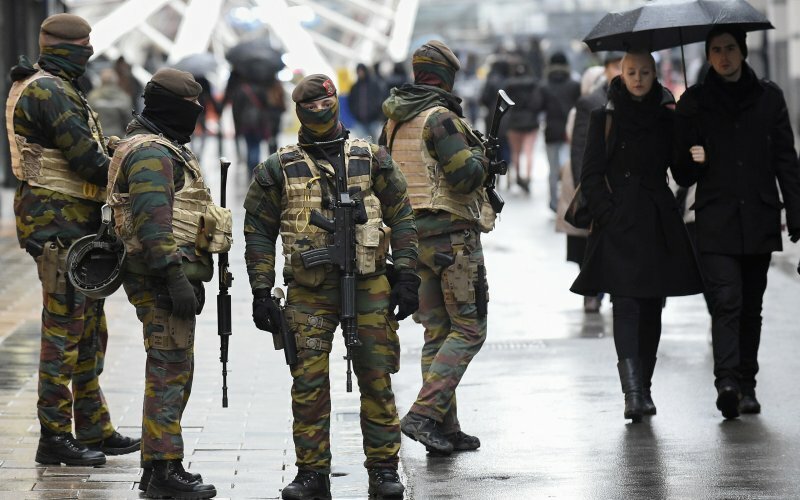 The caption pointed to the soldiers on the Rue Neuve in Brussels, but what about the two figures on the right? Gustave Caillebotte’s painting “Paris Street, Rainy Day” is one of the more remarkable depictions of the bourgeois civil society that made Paris the center of European modernity during the 19th century. The street scene is muted emotionally by the rain that has softened the brick surfaces of the city, while the couple’s comfortable domesticity under their umbrella becomes a small enclave of intimacy within the public space. Their easy entrainment contrasts with the empty spaces and isolated strangers behind them, and with the possible collision involving the stranger approaching them. He will adjust, of course, as will they, and so we can imagine a small ripple in the ongoing flow of urban civility–something to talk about when the couple is sitting at a cafe, but nothing more than that. And certainly not a terrorist attack. I doubt that the photographer was thinking of Caillebotte’s work when snapping the photo in Brussels, but the connection in there in several ways. 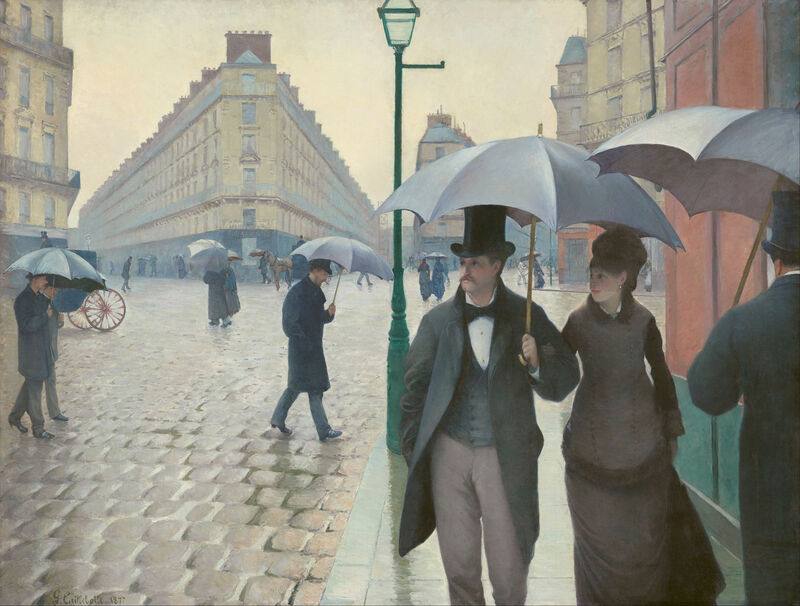 The contemporary couple could be inserted into the 1877 painting without much difficulty: they, too, are comfortably entrained while walking on the street on a rainy day, dressed for going out in public, enclosed in their private space beneath the umbrella, and contrasted with the strangers behind them and with the possible disturbance of an approaching figure who might step into their path. Although not in Paris, they are in a nearby European capital, and the photo is being taken because of what happened in Paris. There also are differences, of course. Now she is holding the umbrella, which might be a small sign of gender equity. The scene behind them is a bit more crowded, and the dress codes have loosened up in the intervening years. Oh, yes, and there are four armed soldiers dominating the pictorial space. That’s not the Paris of 1877. We might want to call it the new normal. If terrorists opened fire, you’d be damn glad those soldiers were there. Short of that, however, their presence is visually jarring, and should be seen as such. Masked, porcine, with multiple appendages, partially immobilized by their gear, suited for lethal conflict rather than civil association, they are visible proof that the civil society represented by the European city has been seriously disrupted. Just as painting captured important features of 19th century modernity, photography may reveal characteristic truths about modern civil society in the 21st century. No photograph tells the whole story, and no painting does either. We also should acknowledge that 19th century Paris was aligned with an extensive expansion of European imperialism, and that the public life of the era was still gendered, raced, heteronormative, and otherwise well short of its Enlightenment promises. In like manner, more than one nation ought to admit that those attacking 21st century Paris are the issue of imperial histories, not least the Western entanglement with Saudi Arabia and an invasion and botched occupation of Iraq. Even so, both the painting and the photograph represent something essential about a decent civil society. In the photograph, the couple on the right seems about to be edged out of the picture. Perhaps they will pass through without incident, but there may not be room next time. Instead of the openness evident in the painting, the civic space has become clotted with military force. If the enduring legacy of the attacks is to make a “security umbrella” an ever larger and more prominent part of urban experience, we may find that we have destroyed the city in the name of saving it. Photograph by John Thys/AFP/Getty Images. The scene borders on the sublime. A silhouette of a woman cast in the glow of a distant fire that appears to be burning out of control. 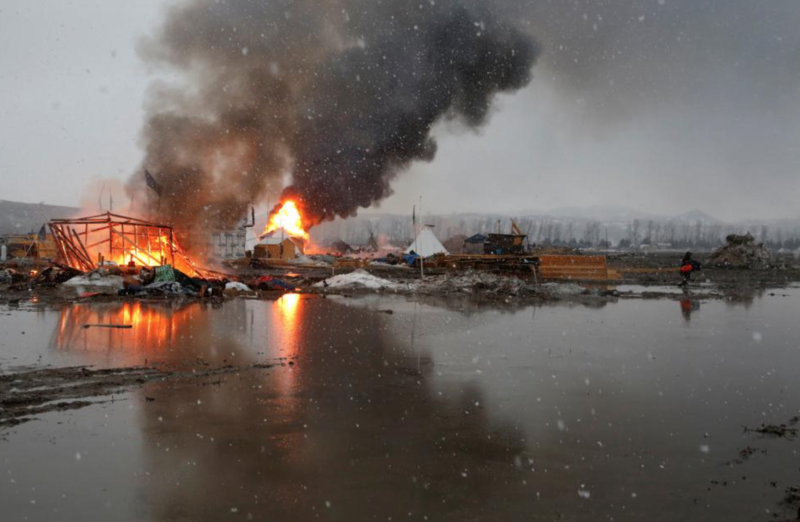 The gulf between the woman and the blaze is altogether calm, inviting a clear contrast with the raging flames and by extension underscoring the space—simultaneously near and far—between safety and danger. And, of course, it is the silhouette that ultimately frames the photograph and its affect. To get the point, imagine the photograph without the silhouette? The contrast of golden hues would still register as beautiful for most viewers no doubt, but all measure of the distance between here and there, of the sublime horror invoked by the image, would be effaced – or at least largely so. All that aside, it was not color or even the silhouette that initially drew my attention to this photograph, but rather the fact that it is a photograph of someone taking a photograph. Photographs of people taking photographs has become something of a convention in recent times, and all the more so now that many (if not most) people in the western world carry cameras with them in their pockets and seem inclined to take photographs of … well, just about everything. And the question is, why? Not why do people take photographs of everything. I think we have done that for a long time now, contemporary technologies simply making it easier and easier to do. Rather, the question is, why has the photograph of people taking photographs become something of a visual trope … and a trope of what? 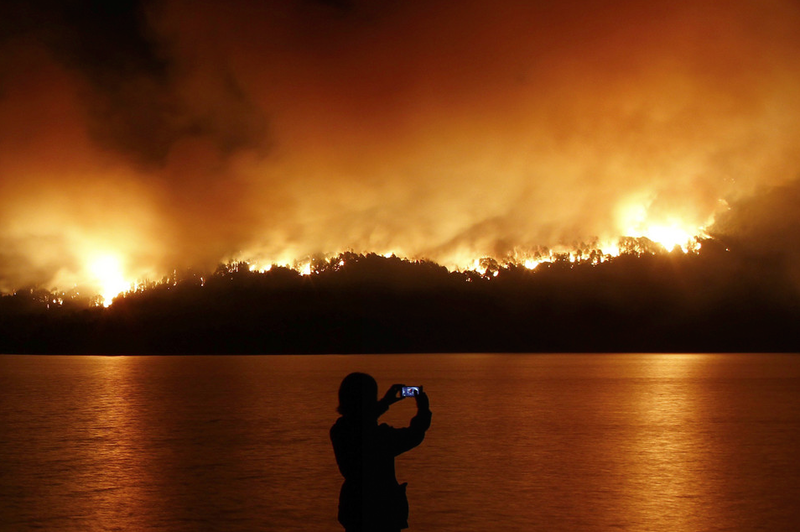 In the photograph above the camera’s brightly lit screen stands in stark contrast with the golden color cast of just about everything else in the image—including the silhouetted photographer—and thus perhaps invokes a sense of the tension between nature and technology, a point gestured to by the caption which notes: “A woman takes a picture of fires raging through the Los Alerces National Park … A lighting strike is believed to be the cause.” And so the photograph here might indeed be driven by a profoundly artistic and/or ideological sentimentality. There is of course no way to know, but the omnipresence of the technology in modern times simply cannot be ignored. Here the caption reads: “People take photographs as the body of Lee Kuan Yew, Singapore’s first Prime Minister is transferred form the Instana Presidential Palace.” One might wonder why we don’t just have a photograph of the body itself being transferred. Or, for that matter, of the crowds gathered to view the transference. What is it about the fact that people are taking photographs of this scene that makes the convention so affecting? I don’t have an answer to this question firmly worked out at the moment, but my suspicion is that it has something to do with the relationship between actors and spectators. There was a time, not so very long ago, when the prevailing assumption was that citizen spectators lacked agency. They viewed events, but they did it from an altogether passive space that muted their political voice if it did not erase it altogether. The seeing citizen did little more than see. 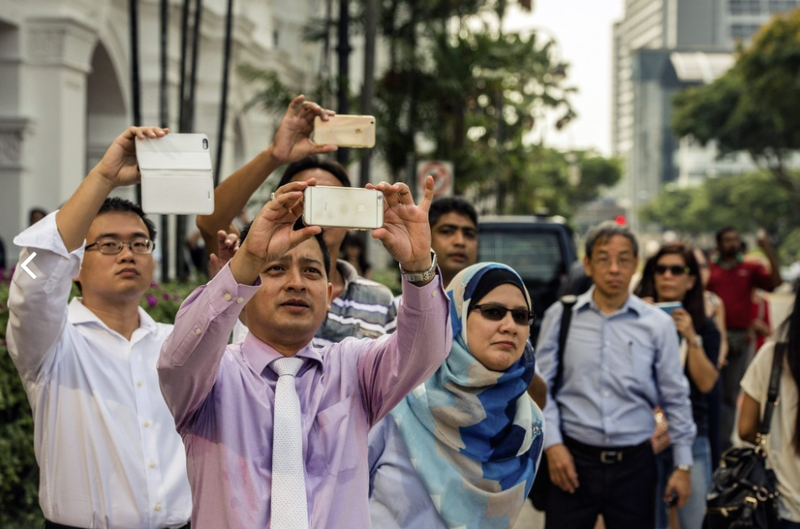 The advance of camera technologies, and in particular the utter ubiquity of camera phones and portable screens, as well as the capacity for digital circulation, has given citizen spectators a whole new way of registering their voice—or is it their gaze? It helps us to see how one person uses their spectatorship to accent the space between culture and nature, as in the silhouette above, or how others mark the importance of the passing of a revered leader. In short, the seeing citizen is now also, and at least in some measure, an acting citizen. We photograph people taking photographs perhaps because it marks an important shift in what it means to be a citizen spectator and, as with photojournalistic images in general, it helps us to understand how we see and are seen as citizens. Photo Credit: Emiliano LaSalvia/Agence France-Presse/Getty Images; Tom White/European Pressphoto Agency. 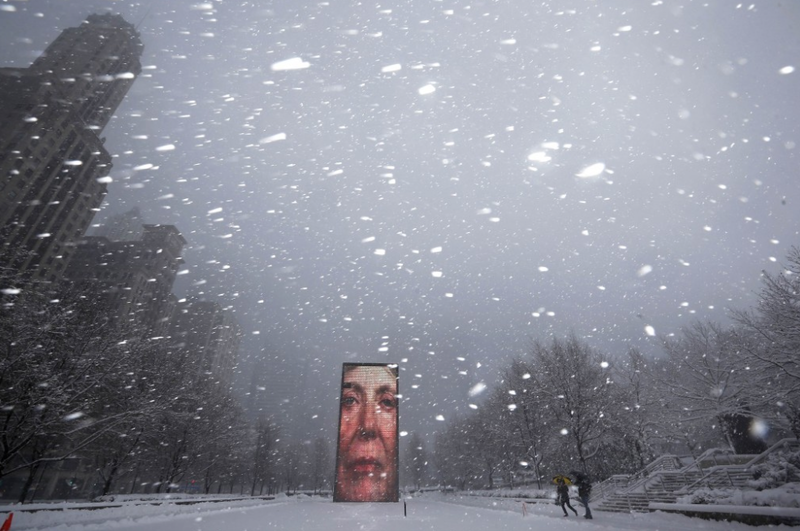 By catching that face amidst the winter storm, the photographer was able to pull out this second sense of the artwork. By doing it with a photograph, he made the artwork doubly reflexive: the disembodied face is now saying something about photography. Or “saying” might not be the right verb. It is showing us one thing, the image as image, to evoke another: the terror of the image. As W.J.T. Mitchell has noted, every theory of imagery is likely to have a fear of imagery lurking within (What Do Pictures Want?, page 342), and the same is true of all of us with our more intuitive relationship to the image world. Human beings, no matter how modern, project animate powers into images, and fear is an unavoidable consequence. Indeed, a statement of Mitchell’s can double as a description of the photograph above: “Pictures are things that have been marked with all the stigmata of personhood and animation: they exhibit both physical and virtual bodies; the speak to us, sometimes literally, sometimes figuratively; or they look back at us silently across a “gulf unbridged by language'” (page 30, quoting John Berger). One might wonder why this photograph would be featured among the images of the day. It is largely a study in blurred perception, an example of not seeing clearly, and of things that can be easily missed without loss. I am no worse off for not seeing the details of the solitary commute of an anonymous individual in a nearly deserted street on a winter’s day somewhere in Boston. The lack of clarity here is not a lesson about political ideology, media manipulation, costly ignorance, or a failure of concern. A January blizzard made both travel and vision difficult; no news there, and nothing to merit a second look. The selection becomes more complicated in you consider that the image is even less likely to be featured in a slide show of winter’s beauty. Think “National Geographic” and many wonderful images will come to mind: the lone evergreen standing between snow-covered hills, red holly berries on black twigs glazed in ice, the low sun glinting through the distant treeline across a frozen lake. . . . or a bustling city transfigured into enchanted silence by incandescent snowflakes falling softly to grace every surface of metal and stone. 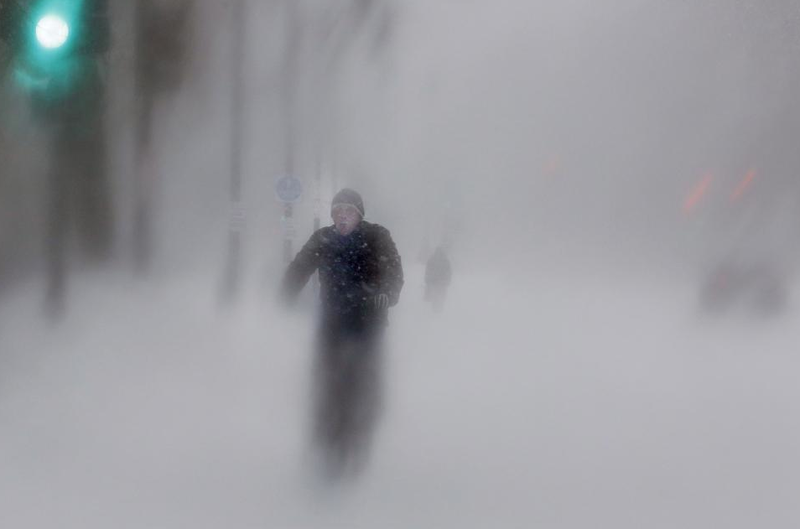 Whatever your images, they probably don’t include a blurred figure who seems to be both moving and stationary, and both solid and ethereal, against a background that is both familiar in its outline–street, streetlight, trees, pedestrian–and yet so hazy as to be remote or unrecognizable. Once we have been told that he is riding a bicycle, the scene may become a bit uncanny: what it is supposed to be, but oddly not quite right. Somewhat like a doppleganger, in fact, or any image, for that matter. Let me suggest that this photograph is a study in public perception, in several senses. First, it suggests that much of what we can’t see here we never really see, as it is part of the taken for granted background that we slide over in ordinary perception. (If the bike had been clearly visible, how much of it would you have been able identify if tested a minute later?) It’s not that we can’t see those things, or even that we should, but that we don’t need to for the ways of seeing that are dominant (and useful) in public spaces as opposed to more expert or intimate settings. Thus, the photograph marks, by blurring, some of what would be in the optical unconscious of photography: what the ordinary observer would not notice but would still be captured by the camera. Second, the photo suggests that much of what we see clearly is actually ghostly–a virtual reality of images that we take for granted as a real world. The public realm is not only the actual spaces that we inhabit with strangers, but also those virtual spaces that we inhabit as if in public, often through media representations of strangers in distant and effectively anonymous settings. (Ask yourself why “Beacon Street” was given as the sufficient descriptor for the intersection being shown: the street runs for miles, while similar photographs could be taken in many other cities and towns around the globe. This is a photograph of a symbolic place.) The traffic light signals “public domain,” and the figure on the bike is not much more distinctive. Blurred signals and a spectral messenger; sometimes that’s all you need. A ghost is defined as a spirit in bodily form, and as a semblance or trace of something, and as a secondary and usually faint or blurry image. All of these concepts can double as characterizations of photography. Some would say they are failings of the medium, but I see it otherwise. Photography’s connections with the spirit world are exactly why it proves to be such a useful medium for modern, liberal-democratic public cultures. As we see ghosts, we see ourselves. The National September 11 Memorial and Museum opens to the public this week. Sadly, we have gotten all too practiced at memorializing human tragedy – the 6th Floor Museum at Dealy Plaza in Dallas, TX; the Lorraine Motel in Memphis, TN; the Oklahoma City National Memorial at the site of the Alfred P. Murrah Federal Building; and the list goes on. In each instance senseless violence and awful, terrible, heart rendering loss is remembered in solemn displays that mix our collective grief with, strangely, tourist-like attractions that often require admissions fees and include “gift shops” where one can purchase everything from books and t-shirts to what can only be referred to as memorial kitsch. I don’t want to be cynical here. I have visited most of these places and I have happily paid the entrance fees—though I have avoided making purchases at the gift shops—and I would do so again, but there is something oddly unsettling about the process and I don’t quite have the words to express what it is. Sometimes photographs can gesture to what words are hard pressed to express—or at least to express in any way that we might consider to be focused and efficient in a clearly narrative or propositional form. 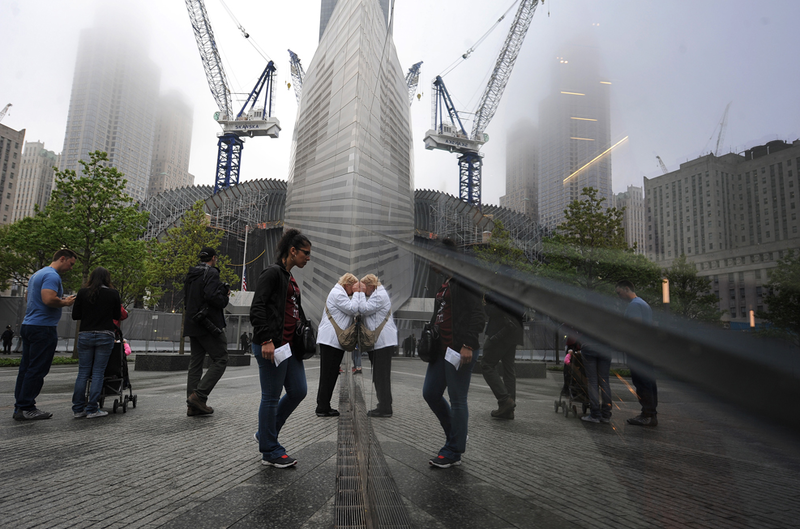 The image above shows several members of the public looking through the windows into the 9/11 Memorial Museum prior to its official opening this coming week, though others appear to be simply passing by. None of the recognizable artifacts of the tragedy of 9/11 are present. One cannot see the salvaged tridents recovered from the World Trade Center, or the accouterments from fire fighters and other first responders, or the cards, patches, and other mementos left as part of various vernacular memorials that surrounded the site of Ground Zero. And truth to tell, but for the caption that marks this as a glass façade that looks into the museum it would be hard to know exactly what we are looking at. But what we can see are the mirrored reflections, both of those who have stopped to look intently through the glass façade and of the life of the city that seems to be going on around the memorial and museum; and here, not just people who appear to be walking by, but also a city that is undergoing construction as marked by the crane in the center of the image, but also those reflected in the mirror (in the upper right corner) that would otherwise be outside of the frame of the image. The key to the photograph is not that we simply see people stopping to look or passing by or that we see a city under construction, but that all of these things are accented by their mirrored doubling in the reflections cast off from the glass façade of the museum itself. It is the way in which the photograph captures (and performs?) the reflection that invites something of a critical sensitivity to what is that stands before us. Whether passers-by choose to stop and look or not, it would seem, is of little matter; what matters is that the memorial is a visual echo of the world that surrounds it. We cannot escape it even if we wanted to—whether we choose to pay the “entrance fee” or not. That is something worth thinking about. I was saddened—and more, really, thoroughly distressed—to learn of the tragic death of photojournalist Anja Niedringhuas in Afghanistan’s Khost Province, murdered by a rogue Afghan police officer as she was preparing to photograph the upcoming elections in that country. Her photography was a testament to what photojournalism at its best enables, which is not simply an objective view of the world, but a complex realism that acknowledges its reliance on a capacious sense of imagination. “Imagination” is not mere fancy—the mind at play with things it already knows—but rather a way of extraordinary seeing that allows us to project our sight beyond the horizon of ordinary observation or conventional belief. Put differently, the photograph is always an indexical imitation of some part of reality, but also a way of seeing that reality more extensively, whether as through the lens of a microscope or a telescope. 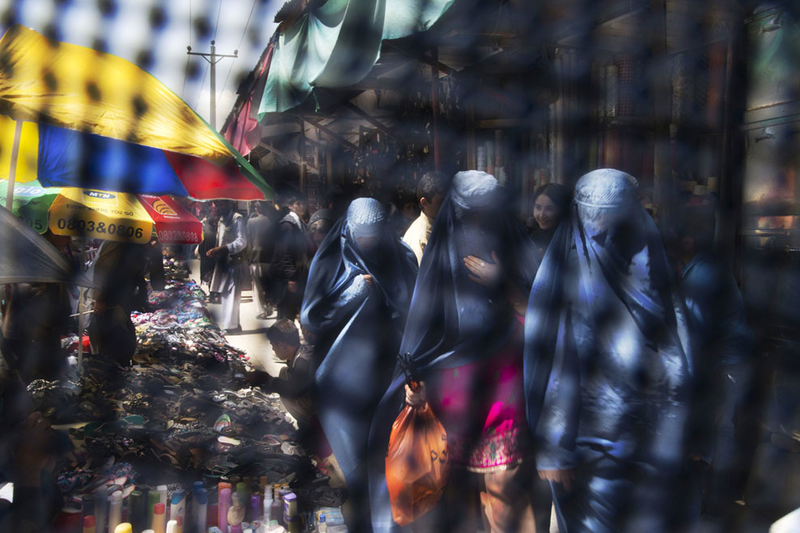 The photograph above is in many ways emblematic of Anja Niedringhaus’s considerable archive of photographs (e.g., see here, here, and here) from Afghanistan. What makes it interesting for me is precisely how it puts seeing and being seen in tension with one another. On the one hand we have a child playing as if she were an adult (no different in this regard than a young girl in the US trying to walk in her mother’s high heeled shoes), and thus being seen, and at the same time underscoring what it might mean to see from that perspective, one’s sight obscured by the screen that alters what can be seen. 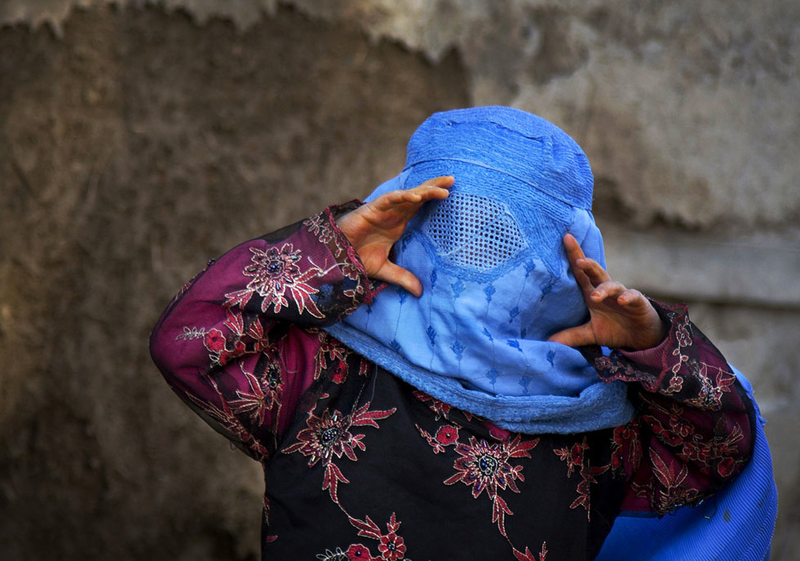 And indeed, the photograph shows the young girl adapting to the change in perspective as her hands frame what the screen in the burqa already limits and obscures. The photograph below, shot at a separate moment in time, provides the reverse shot, focusing more on seeing than being seen. One could make much from these two photographs about how women are seen and what they are able or allowed to see in Islamic cultures, but there is a different point I want to emphasize here as these two photographs double for how the photograph as an optical medium itself works, always and already positioning us as those who see and those who are seen. And as the two photographs above demonstrate, seeing and being seen are not altogether innocent activities (think again of the young girl walking around in her mothers shoes), but are traversed by vectors of power and colonized by societies and their institutions. And it is when the photograph accesses its capacity to energize the imagination in this capacity that it removes us from the world of simple questions of who, what, where, when, and why—all important questions, to be sure—and helps us to see questions of relevance, resonance, and engagement. In short, they can help to pull us out of our ordinary indifference, and perhaps to challenge—or at least acknowledge—conventional wisdom or denial. It shows us as “seeing” and “seen” subjects. Anja Niedringhaus was a master at employing her art—and let there be no mistake, photojournalism is a public art— to display a more nuanced realism that prodded us to see the world in extraordinary ways and thus to imagine what it might mean to associate with others—to see and to be seen—in a more humane fashion.